Fetlar presently has no dedicated facilities for camping or caravanning, however we are working on plans to provide both. 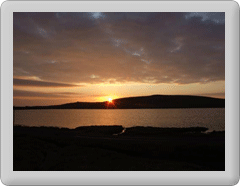 Fetlar hall is currently looking at providing hook up points for Caravans and Motorhomes, with access to toilets. At present wild camping is available at various places on the island, it is always appreciated if you check with local land owners before pitching tents.. Currently the only public toilets are located at the Ferry Terminal at Hamars Ness. For Caravans and Motorhomes with their own facilities onboard. A sheltered flat area can be found adjacent to the Ferry Terminal. Public toilets are available in the ferry waiting rooms. However there is no freshwater available there at present. A public parking area is also available adjacent to the Loch of Funzie which can be used for overnight parking. Thre are however currently no facilities there. Information will be updated here as soon as it becomes available.